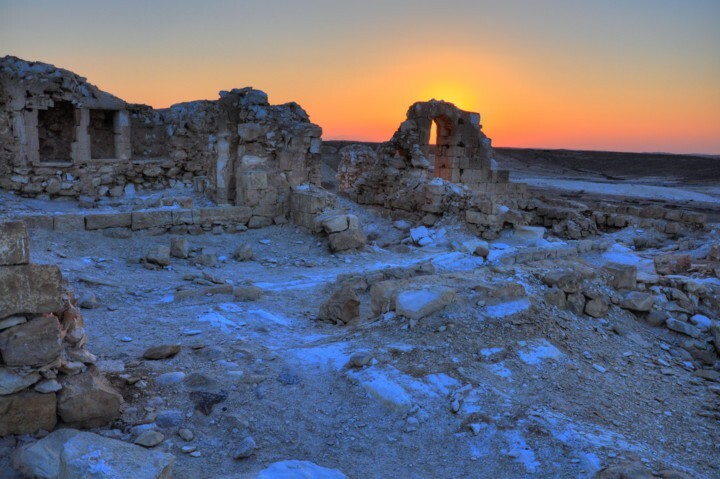 Nitzana (Nessana) was a Byzantine desert city, located on the south-west frontier of the Holy Land. 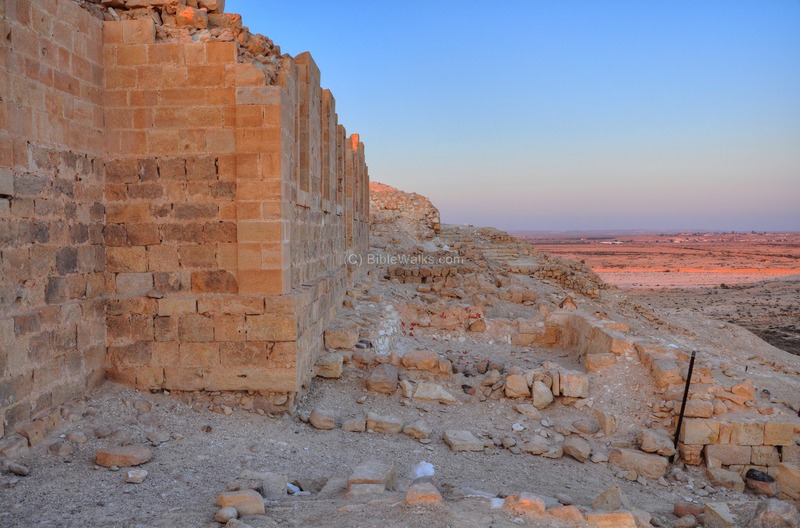 Founded as a Nabatean fortified station along the Incense route, then developed in the Byzantine period. Nitzana (Nessana) was a Byzantine desert city, located on the south-west frontier of the Holy Land. 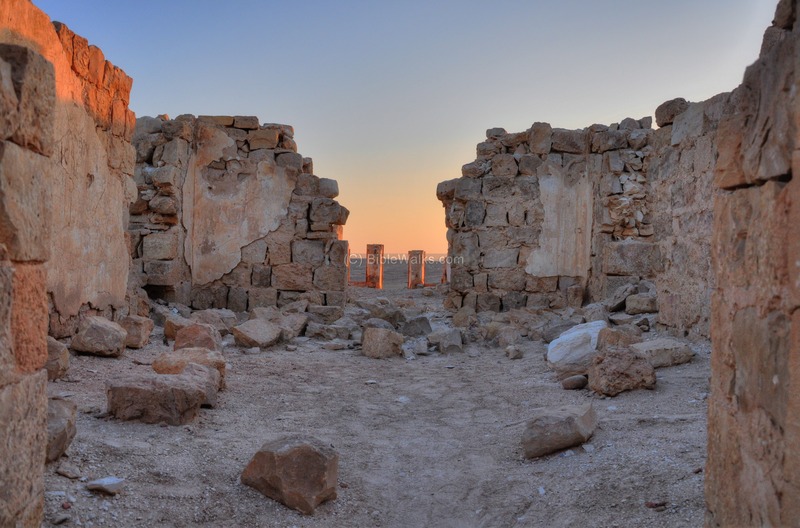 It was founded as a Nabatean fortified station along the Incense route, and later developed as a fortified city in the Byzantine period with three churches. 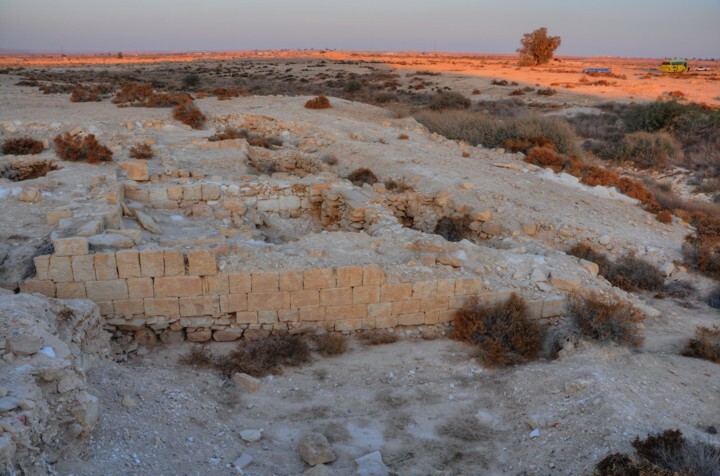 It is the best documented of all Byzantine settlements in the Negev desert, thanks to the discovery of a cache of documents known as the Nessana papyri. 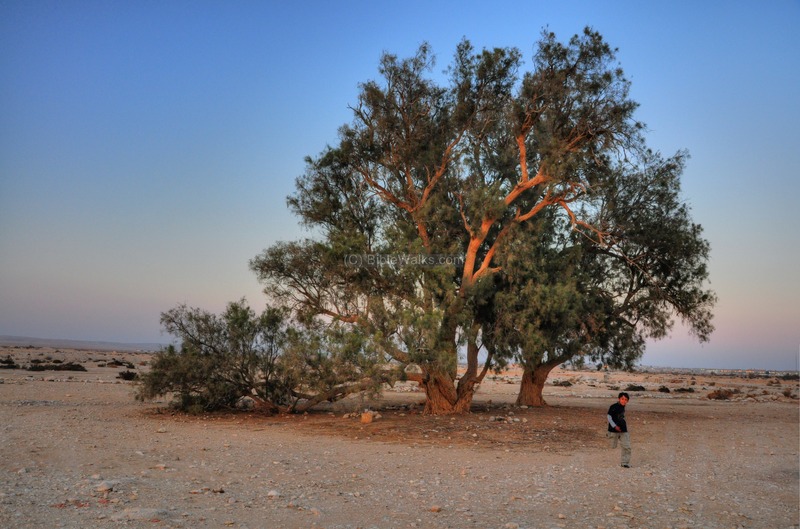 Nitzana is located in the region of the western Negev, close to the Egyptian border. It is 279m above sea level, towering 30m above its area and the Nitzana stream on its east and south sides. The aerial map shows the area, indicating the major sites. The lines of the city wall - in white - are approximately drawn. You can press on the yellow squares to jump down into the relevant section. 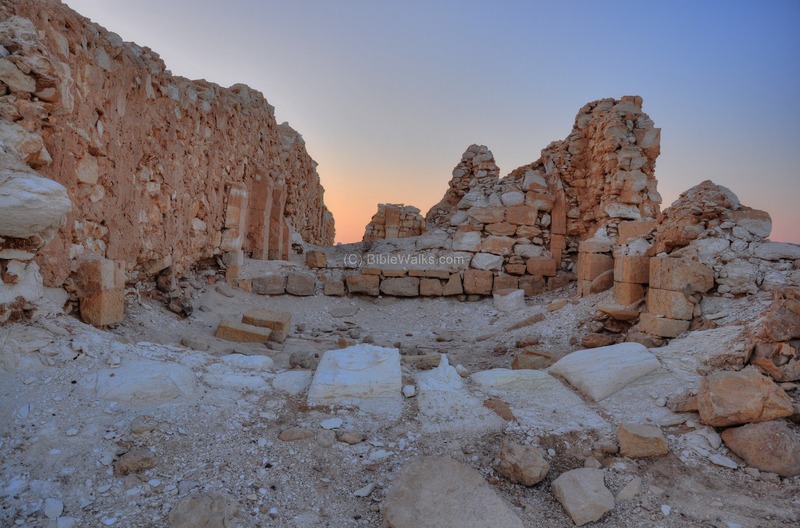 The city was first settled by the Nabateans during the early phase 1 (3rd C BC), as evidence from the ceramics and coins found in the excavations. 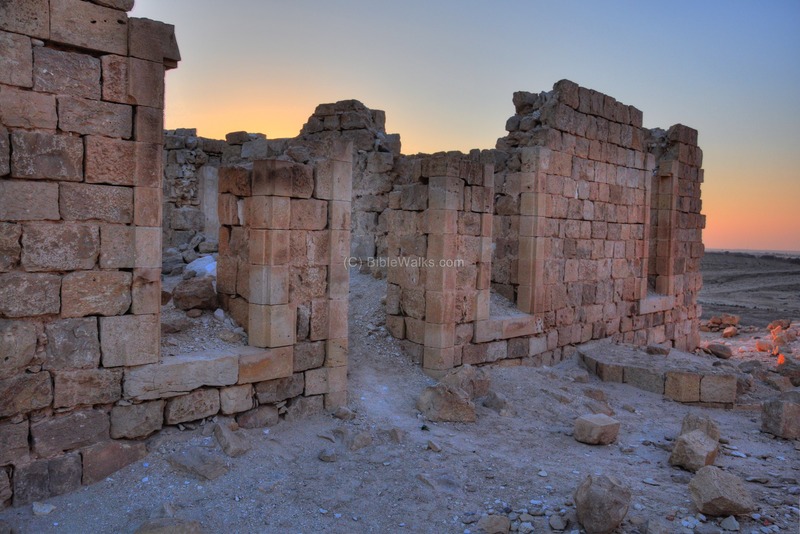 This was one of the stations along the Nabatean trade route called the Incense & Spice route. 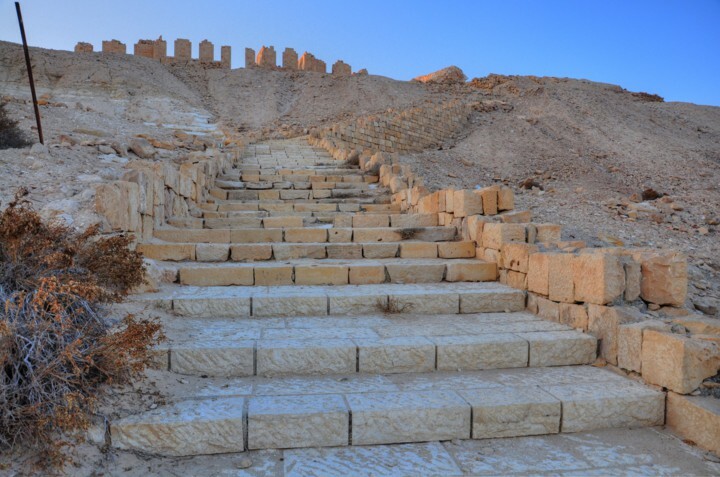 During the 2nd C BC a fortress was built here, and a staircase was constructed, leading from the wells on the east up to the fortress on the top of the hill. 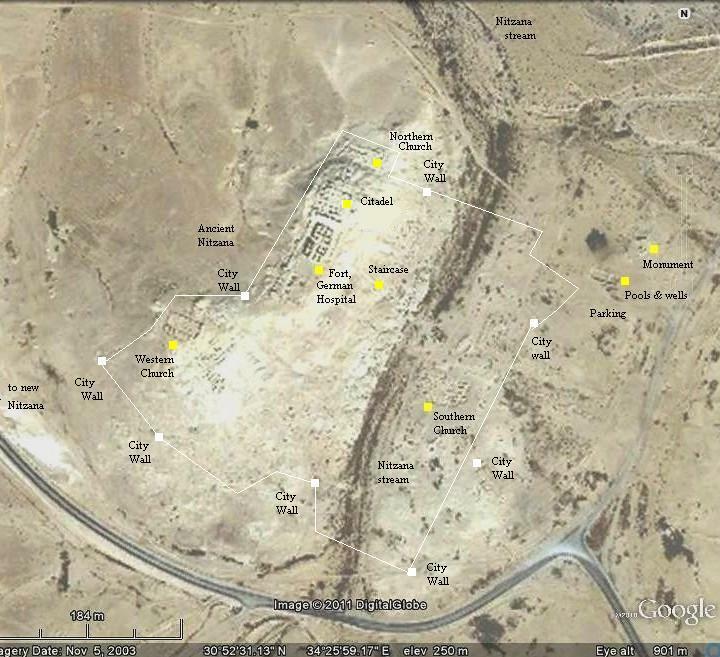 The Biblical map below shows the path of the Incense route, with the Nabatean cities marked with a red star. 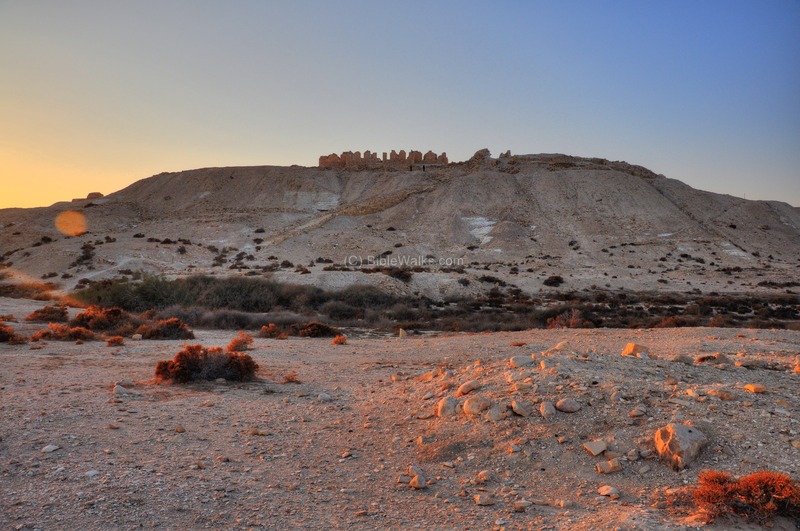 The other large Nabatean cities in the Negev desert were Haluza (Elusa), Shivta , Avdat (Obobda), Rehovot and Mamshit. Nessana (Nitzana) is located on the North-East to South route - Darb el-Shur. 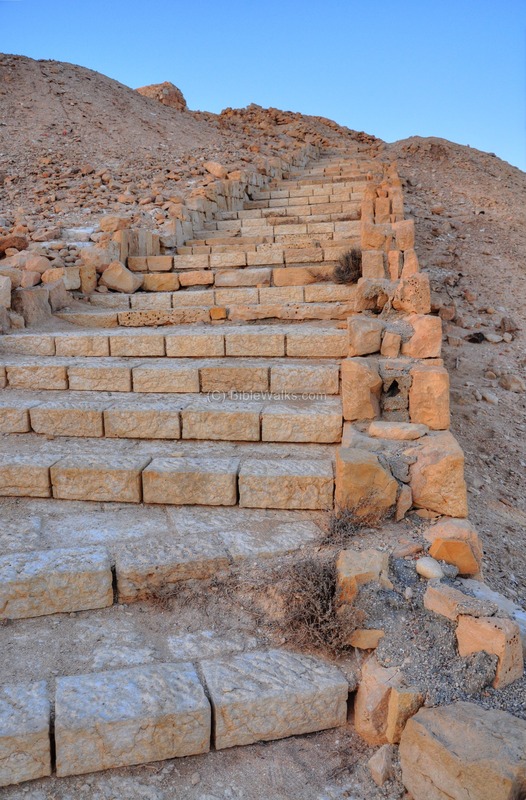 This route is called "The way to Shur" - connecting Beersheba to Kadesh-Barnea. This route is based on the Biblical name, described in the story of Hagar and Sara (Genesis 16, 7): "And the angel of the LORD found her by a fountain of water in the wilderness, by the fountain in the way to Shur.". It is indicated as a dashed dark-grey line on the map. 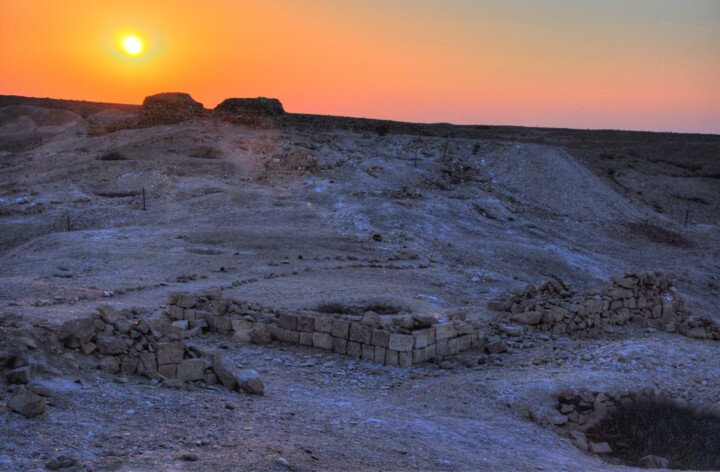 During the Hasmonean dynasty, the early Jewish Kings worked together with the Nabateans. 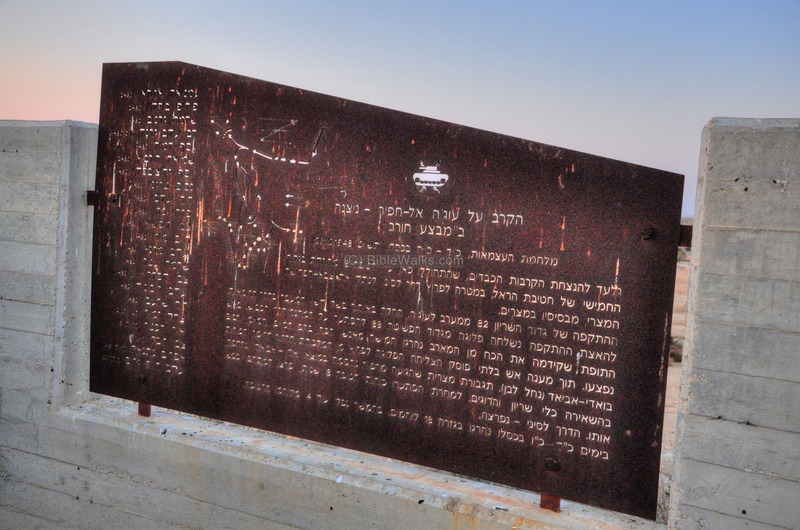 This changed when in about 100 BC the Hasmonean King Alexander Jannaeus conquered the port city of Gaza, the final station of the Incense route. Evidence of a possible control of Nitzana was found during the recent excavations with the finding of coins of King Alexander Jannaeus. In 106 AD the Romans annexed the Nabatean Kingdom, and Nessana and other Nabatean cities became part of the Roman empire. 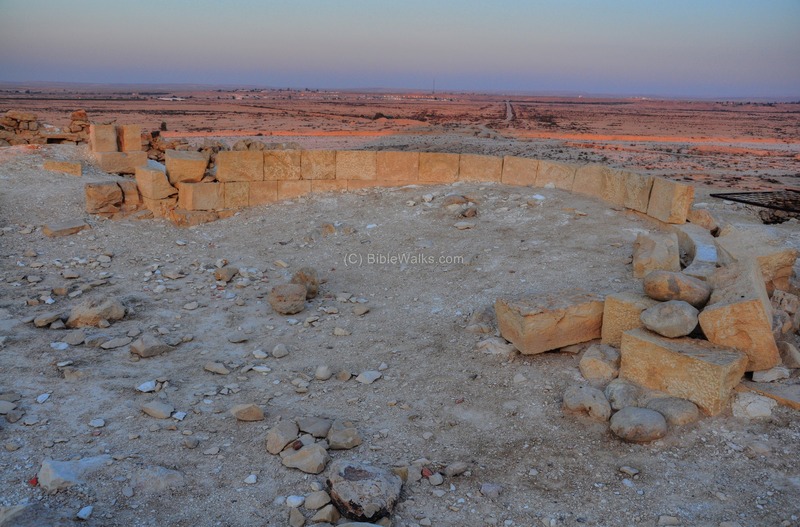 This was a turning point in the history of the Nabateans. The Incense route declined at the end of the 1st C AD, since it was replaced by other routes through the Roman empire. 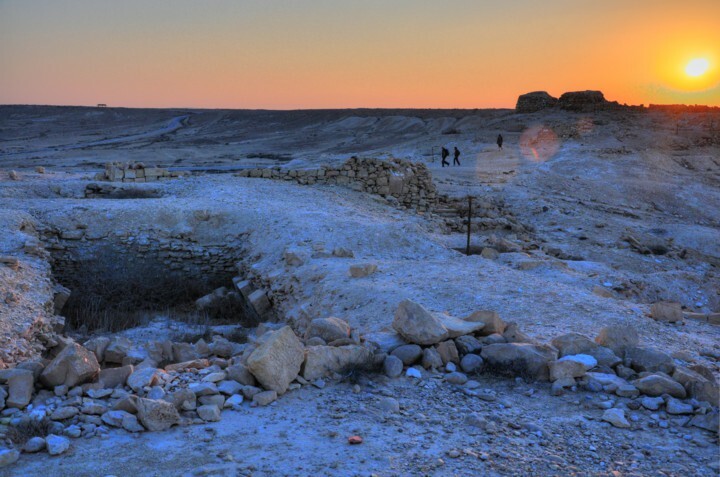 The Nabateans gradually switched to the development of desert agriculture and providing support to the Roman army and travelers along the desert roads. Many desert farming areas are located around Nitzana. Since that time Nessana was not developed any longer until the Byzantine period. 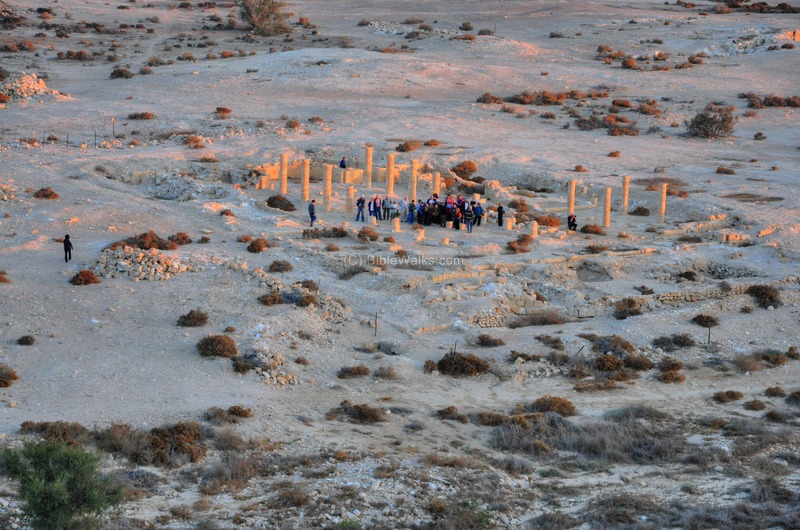 The Nabateans converted to Christianity starting at the 4th C AD. 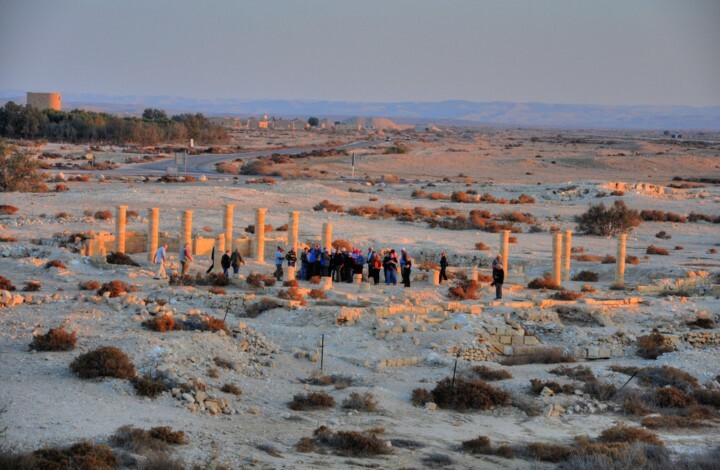 The region became a center of pilgrimage and monasticism, starting from a major center in Gaza and then spreading around the Negev desert cities, Jerusalem and the Judean desert. The Byzantine empire encouraged the development of the border cities such as Nessana and Shivta by financing public projects and roads, reducing taxes and relocating population from the north. During the reign of Theodosius I (379-395 AD) a fortress was built on the northern peak and a military garrison was established. Six or seven churches (!) were built in the city, as well as other public structures and water systems. The residents of the city offered services to the great number of pilgrims who passed through the city. Nessana prospered in the 6th and 7th C like the other central Negev cities. After the Muslim conquest (about 634 AD) the city gradually declined. The sources of income (farming and pilgrimage services) started to dry out. 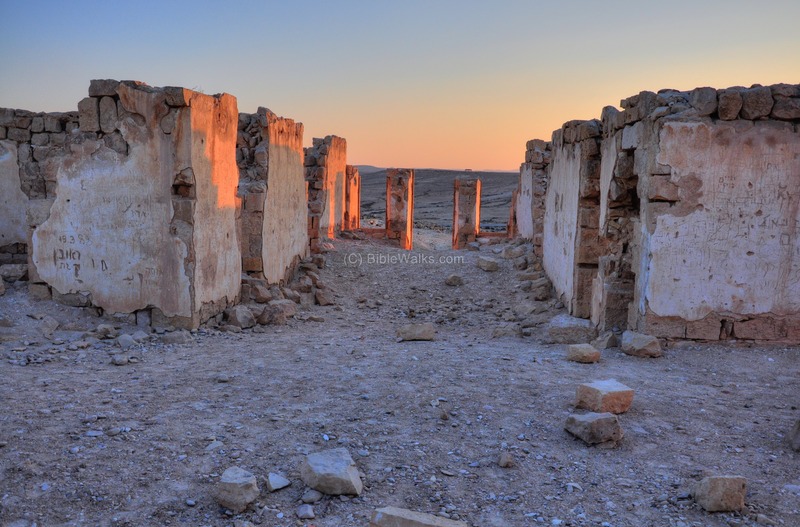 The residents gradually deserted their homes, and the city was totally abandoned in the 9th C. The city remained in ruins until the 20th C.
Border Town: The Ottomans constructed a Police station, army base and telegraph office in 1912 and established a regional center in 'Auja, which was located on the border with the British controlled Egypt. Their efforts to build up their military presence along the border with the Sinai peninsula were rewarded a few years later, during the campaign against the British in Sinai. A number of structures were built on top of the hill, including Government house and a German hospital, which caused severe damages to the historic site. A guest house was constructed in the lower city, almost wiping out the entire ruins. The Ottoman soldiers dug defense holes in Nitzana, further ruining the site. Railway: During WW1 (1914-1918), the Ottomans attempted to conquer the Suez canal from the British, and managed to reach the Suez canal in 1915. They supported this mission by laying out an extension to the western Hejaz railway section from Damascus to Afula, which was built in the years 1900-1908. 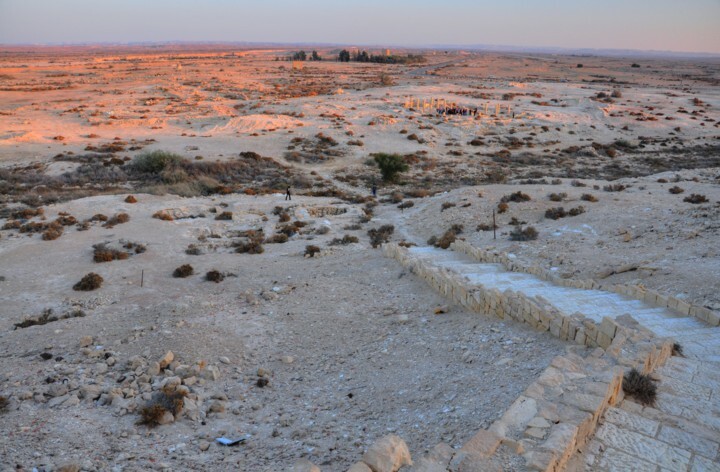 This railway was extended to BeerSheba in 1915 and reached Nitzana in 1916, then it reached as far as Kuseima (Biblical Atzmon, 10km west of Kadesh). The design and management of the entire Hejaz railway project was commissioned to the German engineer Heinrich August Meisner. In Nitzana was a station, a water refilling station for the railway, a number of large army camps. Robinson visited the ruins in 1838 and 1856, falsely identifying it as Oboda (Avdat). In 1870 it was visited and illustrated by Edward H. Palmer, a British-born Arabic linguist as part of the Palestine Exploration Fund (PEF) survey. In 1896 and 1902 the Czech explorer Alois Musil made another visit to the site and reported his findings. At that time the ancient city was almost intact, but several years later the Ottomans destroyed the ruins. The first signs of the destruction was witnessed by E. Huntington (1909), who also discovered and documented inscriptions. In 1914, 6 months before the war, the site was described and sketched for the Palestine Exploration Fund (PEF) survey by T. E. Lawrence (Lawrence of Arabia) and C. L. Woolley (archaeologist). They reported the findings and the damages by the Ottomans, and also on the Ottoman military positions (which helped the British forces in their conquest 3 years later). An extensive excavation was led by the archaeologist Dunscombe Colt (1936-1937). Their major finding was the "Nessana Papyri", a cache of documents which detailed the events during the years 505AD-689 AD. This collection has 195 documents written in Greek and Arabic, and it provides important information on the life and the history of Nessana during the Byzantine period and the early Umayyad Arab period. 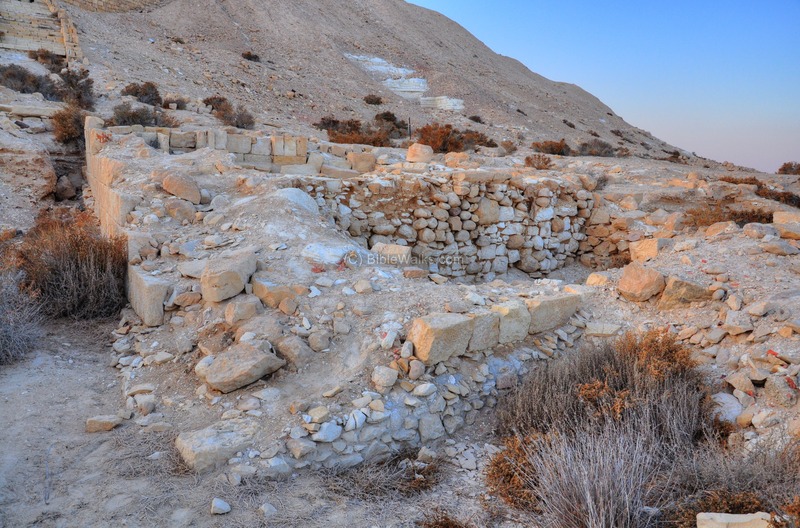 During the British Mandate, Nitzana was a small border town with several dozen residents. In the Israeli Independence war (1948) the Egyptian army captured the town, and held it from May until December. It became a demilitarized zone during the years 1949-1956, and is under Israeli control since then. Extensive excavations were held by the University of Ben-Gurion (1987-1995), directed by D. Urman . and J. Shereshevski. Nitzana is a national park and open to the public. 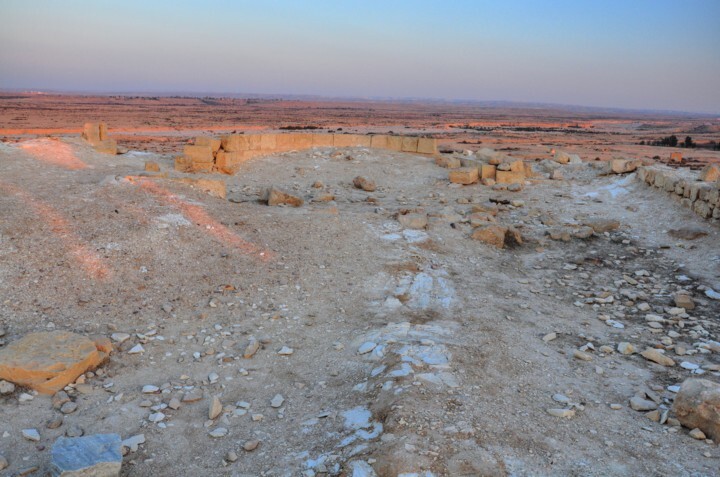 An eastern view of the acropolis of Nitzana is seen in the photograph. The ancient city of Nitzana/Nessana was located in two sections - the "upper city" -on top of the hill, and the "lower city" in the eastern plain and foothills. The Nitzana stream curves around the hill from south (left) to north (right), separating the two sections of the city. 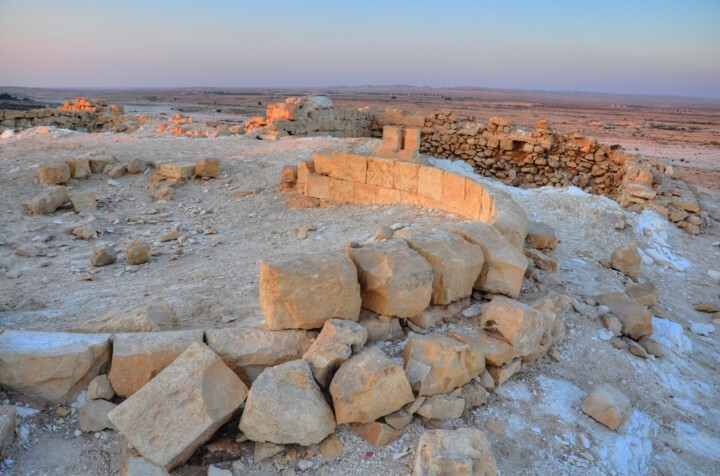 The top of the hill, where the ruins of the upper city are located, is about 150m long by 40-50m wide. A closer view from the south-east is seen in the next picture. A wide staircase leads up from the bottom of the stream to the top of the hill, a climb of 30m in height. The reconstructed staircase is seen here in detail. On the north side of the staircase are remains of buildings. A view of the excavations to the north of the staircase. The Nitzana stream is seen in the background, looping around the hill from south (on the right) to the north (on the left). The parking area is on the upper right side. During WW1 (1914-1918) the town of 'Auja became an important military center for the Ottoman and German armies, and launching base towards the Suez canal. 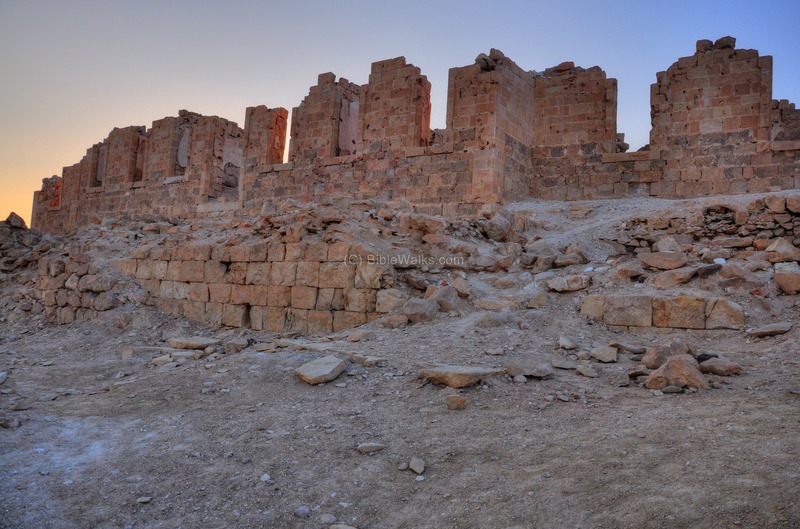 Government offices (the Saraya) and a German hospital were built by the Ottomans and Germans on top of the Byzantine fortress, causing severe damages to the ancient site. The ruins of these buildings are seen in the following pictures. The northern entrance to the ruined structure is seen next. The excavators found remains of a a 15m square fortress which was built by the Nabateans during the 2nd C BC. This was the first phase of construction in the city. The small fortress was then replaced by a Citadel during the reign of Theodosius I (379-395 AD). It occupies a large section of the acropolis, and is located on its northern side. The citadel is fortified with square towers. A large number of small rooms are located on the western and eastern side (the latter is shown below). This northern view shows the apse of the church, and the north wing of rooms on the far side. In one of the rooms of the Church the cache of documents were found by the Colt expedition. The church has a single apse facing the east, and offers great views of the area around Nitzana. Another view towards the east. The church is surrounded by courts and rooms on both its north (left) and south (right) sides and a baptistery on the west side. The south wing is built along the wide wall of the citadel. You can see a short video captured from the Northern Church. 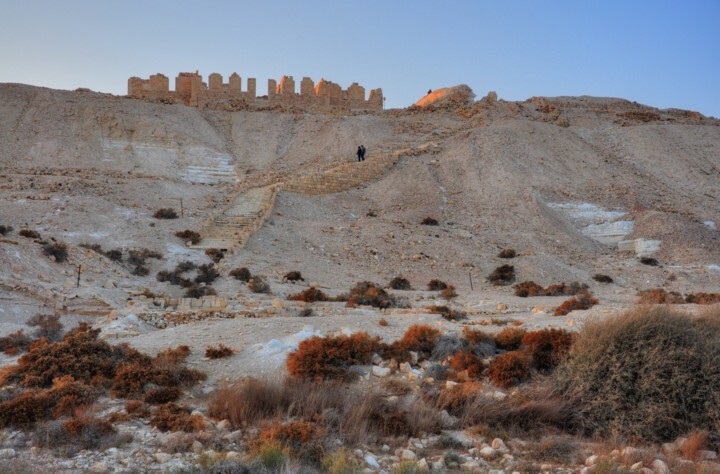 The movie shows the view (from north, clockwise) of Nitzana Creek ('Auja el-Hafir), the monument and wells area, the southern church, the WW1 structure on top of the hill and the Byzantine Citadel. The other church on the acropolis is seen below on the right side, and is located on the south-west side of the acropolis. The church is connected to the Citadel by a wall. The church, named after Saint Mary, is a small (25 x 30m) basilica style church with three apses and a baptistery. You can see a short video, as captured from the south-west side of the acropolis. The movie shows the views (starting from west, then clockwise) of: the western church, the WW1 structure on top of the hill, the Byzantine Citadel, the Nitzana creek below the hill, and finally - the lower city on the eastern side. The southern Church is located on the lower section of the city, across the path of the stream. The structure was severely damaged by the Turks in WW1 who transformed it into a guest house. The following picture shows a closer view of the ruins of the church. Its design was a basilica style, with one apse facing the east. There were two chambers on the north and south sides (Diaconicon and Prothesis) with small apses on the eastern side. The church was part of a monastery. Several chapels and rooms were attached to the church. The team headed by Urman (1990) discovered the remains of two more churches, 150m south of the Southern church. Another (6th) chapel of a small monastery was found by the same team on the northern slopes of the acropolis, to the north of the Northern Church. An entrance to a deep well is located near the entrance staircase to the city. 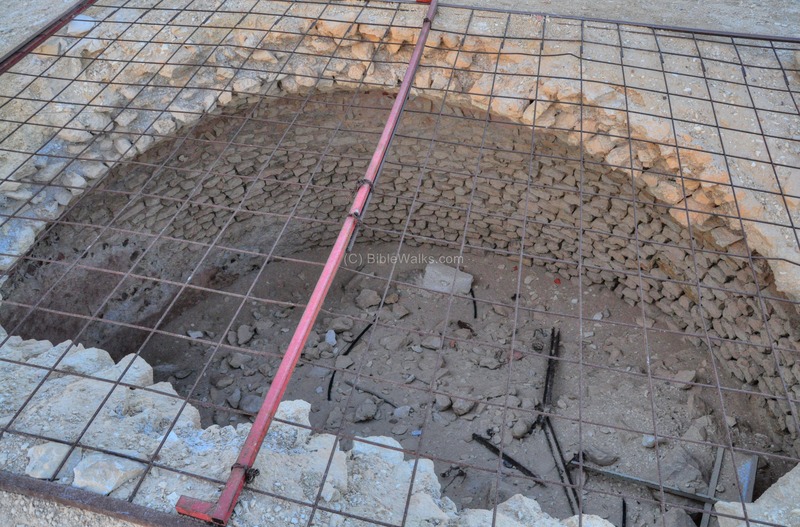 Another well is located closer to the monument. 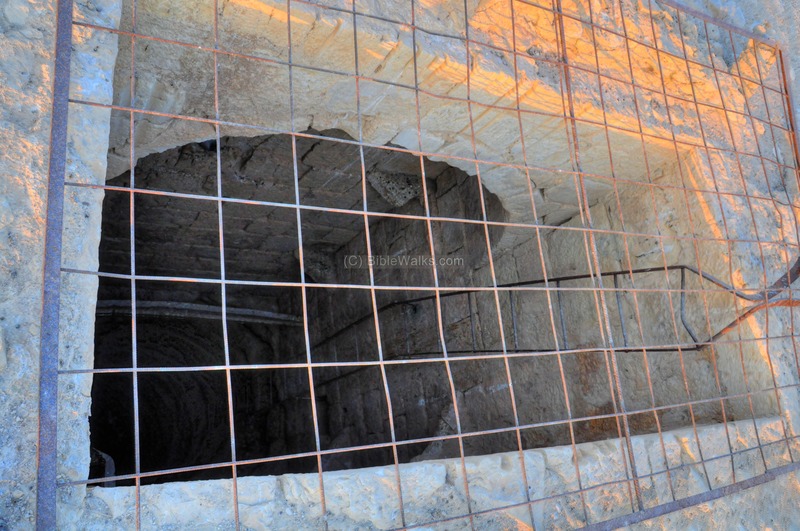 The waters from the well were pumped into the nearby pools. Two large Eshel (Tamarix aphylla) trees are located near the well. A closer view on the barks of these trees is below. 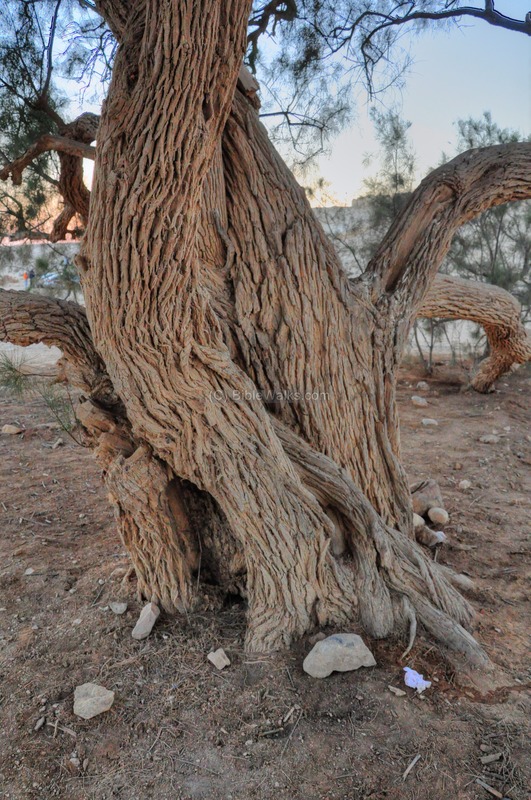 This desert tree is mentioned in the Bible, when Abraham planted these type of trees (in the KJV version - appears as grove) in Beersheba (Genesis 21 33): "And Abraham planted a grove in Beersheba, and called there on the name of the LORD, the everlasting God". 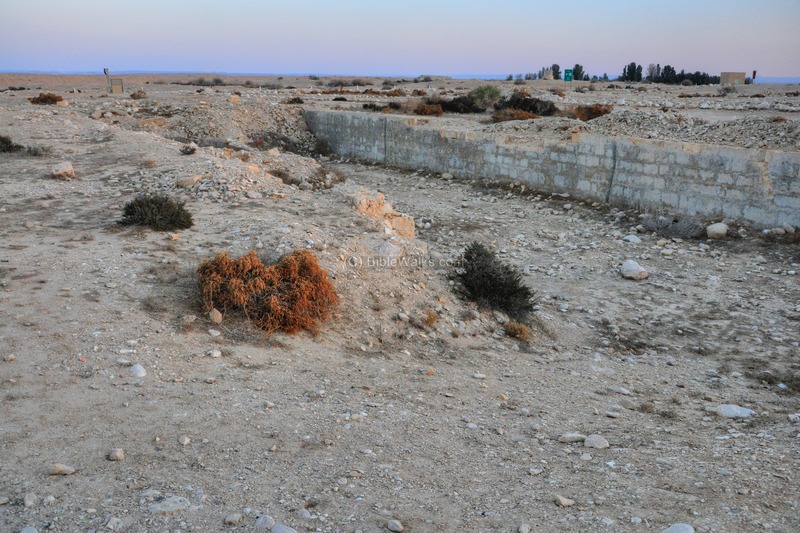 The area of Nitzana witnessed heavy fighting between the Israeli forces and the Egyptian army in the last days of the independence war (26-27 December, 1948), as part of operation "Horev". 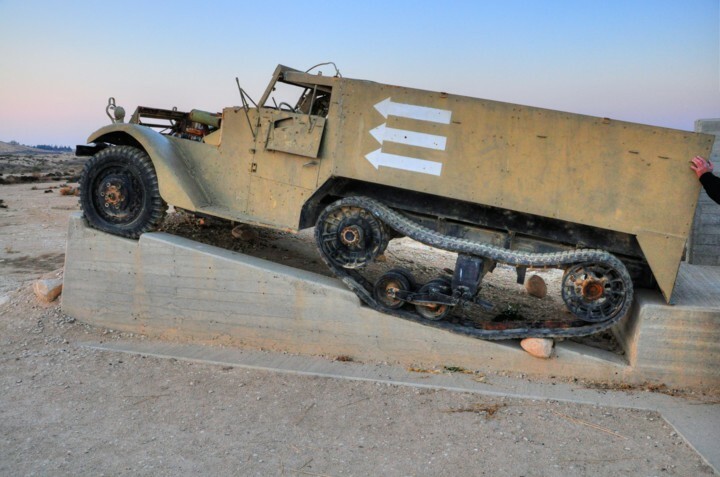 A monument was erected on the north-east side of Nitzana, honoring the 89th armored regiment. The Israeli fighters attempted to conquer the fortress on the hill, but were repelled with heavy losses. The hill was captured after the next night. 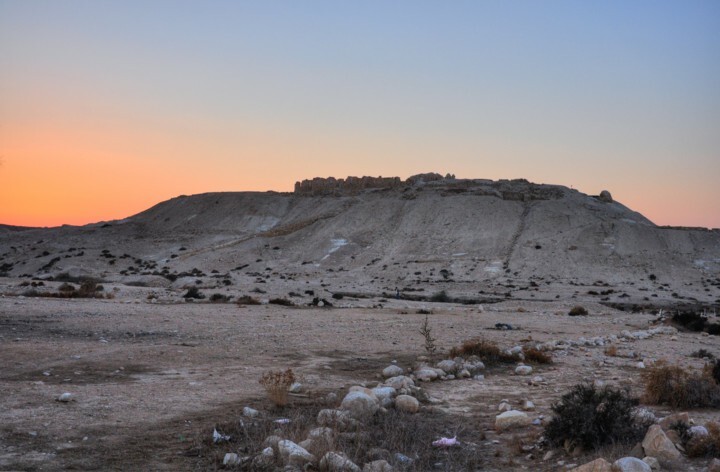 The monument lists the 22 dead soldiers and describes the battle in Auja el-Hafir. After the capture of Auja the Israeli forces continued into the Sinai area, but was directed by the UN to return to the original border near Nitzana (January 2, 1949). Nitzana - Unknown source, perhaps based on the Hebrew word "Nitzan" - bud. 'Auja means "crooked" and refers to a deep brook. Khafir - the name of the well, means "the dug" well. "The crooked brook of the dug well".